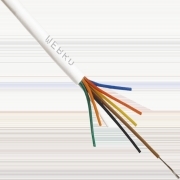 Our comprehensive Webnet portfolio of Category Cables includes Category 5e, Category 6 and Category 6A versions compliant with ISO/IEC 11801 ed 2.1 (2008) Class D, TIA 568.C.2, and ISO/IEC11801 standards. Our range of category cables are suitable for use on Local Area Network Solutions, and available as Solid conductor for Horizontal cabling and Stranded for patch/work area environments. The Webnet range is available as unscreened (U/UTP), foil screened (F/UTP) and foil and braid screened (S/FTP) varieties. Most of the Webnet range is available from stock for collection or delivery. All orders placed before 5pm can be delivered next day subject to confirmation at time of order. Additionally we can also manufacture bespoke cables to your specific requirements.